The search for the ideal garden shouldn't stop with flowers. Ferns and grasses and of course sedges are a wonderful complement to any garden, but even more so to a rain garden. If you've ever visited a wetland you'll know that a vast number of the plant species you'll find there are, in fact, not wildflowers, but water-loving grasses, ferns and sedges. These plants love the sun and can come in a variety of shapes, sizes and shades of green to fit any taste. Ferns are another type of plant that loves the wet, but are usually in need of a large amount of shade. 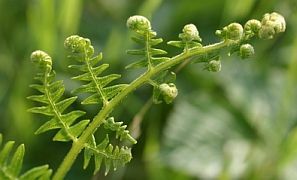 Even so, simply planting a tree or a shrub in your rain garden will cast the needed shade for your ferns. Sedges, grasses and ferns also provide the native wildlife with an abundant source of food, nesting material and hiding places and of course places to perch or rest. Planting just wildflowers leaves a very large nich open, forcing a lot of wild life to go searching other places. Look for local growers at Plant Native or 10,000 Rain Gardens. Before proceding further there is one plant that you'll find just about anywhere in the United states and much of the rest of the world. You'll find it anywhere that is wet, year round. I'm sure you've all seen Typha latifolia or Cattail on roadside or along the edges of wetland. Cattail can grow large, up to nine feet tall and it's tell-tale comb blooms in May. Many parts of this plant have been widely used by the Native Americans as well as ancients around the world, including the leaves in basket weaving, the seeds for padding and the comb for eating.